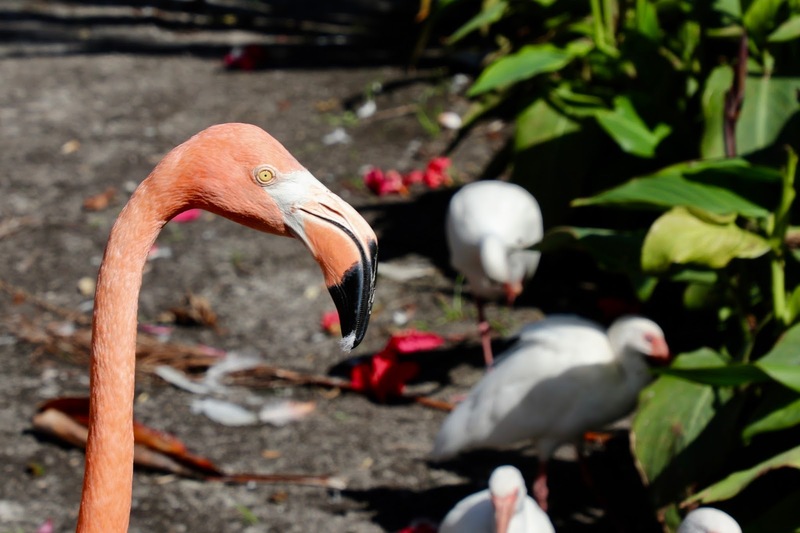 Everglades Wonder Garden in Bonita Springs has a bunch of flamingos. The attendant told me that they are very long-lived. These are 37 years old. What is the correct name for "a bunch of flamingos"? Why, a stand, a colony, a regiment or a flamboyance. Bet you didn't know that. Flamboyance fits perfectly for these astonishing bird. I think flamboyance seems the most appropriate. Love the name "flamboyance" for a group of flamingos. Colorful shots. I love that word flamboyance! I never would have guessed that these beauties lived to be so old, Jack! Yes, flamboyance sounds right. These are a fabulous colour. They always strike me as quite unlikely birds, much as giraffes do in the animal kingdom. You mean these things are real and come with feathers? I thought they were only found as plastic lawn ornaments! Will wonders never cease? ;-) Great shots!